Tone 2 represents Duality. Duality represents the separation of Self from the Whole. We are separated by differences, and long to be reunited as One. Separated by our own identity, we’re posed with the question, “To be, or not To Be.” Do we dare to be who we really are and who we want to be? On Tone 2 we naturally consider one thing or another. We are offered a Choice of Creation. We are offered the experience of manifestation we would Love to Know. We imagine what could be. Sun/AHAU represents the Supreme Lord of Creation, the Omega – the All-In-One. In every encounter with the Sun, we can expect a Revelatory Experience. Sun/AHAU illuminates all things – that which is hidden in shadows, or hidden in plain sight. AHAU is the Master of all things, the Father of Creation that Knows how to manifest anything. The Sun fulfills a purpose of Life, Light, and Happiness. The more Life, Light, and Happiness we can hold, the more Powerful Creators we will Be. The Cherokee Day Sign is the Flower. The Flower represents the way of drawing Life, Light, and Happiness with faces following the Sun as it crosses the sky. CAUAC is delivering the Pure Light of Love to regenerate our Spiritual Battery. The Flower demonstrates a way we can Choose to Receive it. In our Tzolk’in harvest cycle of transformation we are completing an Intention and Energy of stabilization. All the fundamentals for growing to maturity have been learned. We learned our Spiritual Gifts, we learned that Creating something we Love, will always lead to Higher Creations. We reached the Light as the sprout. We grew our real leaves that identified who we are. We’re prepared to spread out with more leaves to take in More Life, Light, and Happiness. “Putting on the leaves that take in the light” is our Human branching out to receive all the Love we can through our Relationships with one another and the Natural World. Just like the Flower whose face follows the Sun, we’ve been prepared to “Look for Love” all around us. We always find what we’re looking for. Sun/AHAU shines a Light on the Truth that we’re prepared to Grow to Maturity. We’re ready to Receive an Inspiration of Love that will Empower a Dream of Being. The Transformer/CIMI trecena offered the Wisdom of Change and how to see beyond the Chaos to the Future of our Dreams. We were given the provision of a “soft hand” to navigate the Chaos of a Major Life Change. We learned that Love, all Love, wherever we can experience it, holds the Power to Heal and Empower Possibilities. The Chaos is not “what is” but the whirling of life and all the possibilities up in the air. Love holds its own magnetic attraction. Humans are naturally attracted to Love. That should be a Sign big enough to prove our own Divinity. We run toward Love. We’re willing to make the ultimate sacrifice for the Sake of Love. 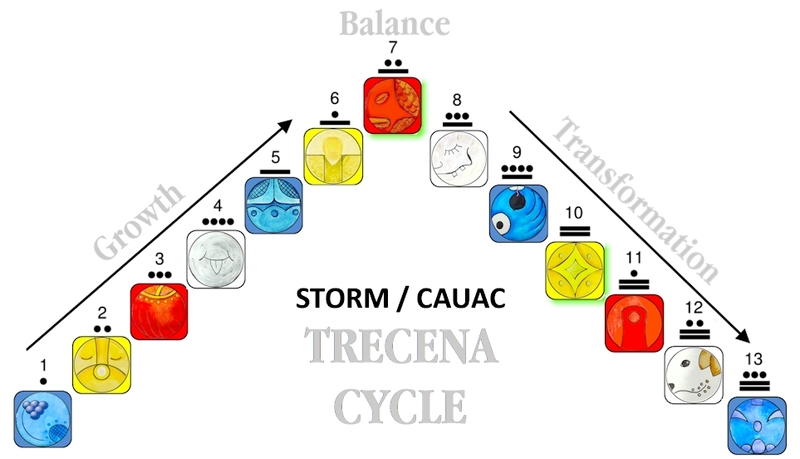 The Storm/CAUAC trecena is sending an Unbridled Charge of Love like Lightning that is attracted to us. We’re called Home where the Center of our Love can receive the full dose of CAUAC’s Power. CAUAC is a deliverer – the midwife that brings a New Spirit into the family. From the safety of Home within, instead of seeing chaos, we only see Possibilities in the Air. Magnetized by Love, we’ll Know all the pieces of Our Dream will be Divinely Attracted to us. Filled up again with the Creator’s Love, we’ll know before the pieces are drawn together they will fall in place as our Heart Desires. I’ve been thinking about the Power of Consciousness to create our own reality. I’ve wondered how more than one reality could exist in the material world. How could I live in my own made-up world with others around me holding different ideas. We do this all the time. We define it as, “someone living in their own world.” We experience reality as our own train of thought. When we’re happy, we want to do happy things. “Living in our own world,” we can do happy things in spite of what is going on around us. Maybe we carry our own little sphere of reality with us. Some may pass close enough to feel it and others will only see us as “detached from reality.” We have a Right to Choose our Reality, as long as our sphere doesn’t interfere with the choices of anyone else. Like a catalyst, the energy of Number 2 creates a reaction – a Reflection upon an Inspiration we receive in the Unity of Number 1. 1 (Hun) is the creation of Human Being, the Fire of Consciousness, and 2 (Ka/KAB) is the Woman who is the Womb of Creation. The Divine Feminine discerns the Inspiration for the Creation of LOVE. Woman was Divinely Gifted. Bearing the suffering of Creation, the Woman Knows Compassionate Love for Enduring Creations that fulfill a Meaning and Purpose of Love. Without Divine Discernment we’ll only manifest creation by a worldly set of values. On Tone 2 we are led to Choose the Creation that will generate the most Life, Light and Happiness in our Us. Our Light of Believing will shine for the whole family. I woke up thinking about dirt, a handful of it. It was as if I’d never really seen it before. I saw the Holy Ground of Mother Earth that is able to grow anything. Throw one seed of corn in Earth and it will Multiply to Abundance. Earth is a Medium for the Creation of Abundance. Earth is by-far more valuable than Gold. Mother Earth is the Source of every Treasure. This was God’s Gift to Human for every possibility of Creation. We couldn’t pick up a handful of Mother Earth that didn’t have something growing in it. The longer I follow the path of the Tzolk’in, the more I’m convinced that our Transformation is meant to be EASY. The Wisdom was all placed in plain sight. All Human would have to do to figure ANYTHING out was to think about it. Imagine that. All we need is the Consciousness to think about all the little things we already know. We want to find GOLD, when the thing of greater value is DIRT. Yet, we’re pawing through piles of DIRT, just to find a speck of Gold. The Consciousness to Look at What Can Be by ALL THAT IS, the Power to create something of Meaning and Purpose would only make sense for Living Dirt that holds the Power to Think and the Heart to Love. We were placed here in dirt with the Intention to Grow and Create. If we were made Creators by Intention, what would a Supreme Creator Intend for us to Create? We could grow anything. If we saw our Self as Rich as Earth why would we create anything else but something We Love? It’s supposed to be different. Our own Creation will manifest our own Greatest Happiness. It only makes sense when we think about it. The way to manifest our Dream, and all the mysteries of Life, are waiting for Human to Choose to Know Them. We were born with Consciousness for a Reason. Our Spirit was born Knowing the Highest Reason for any Creation. Love is the Highest Response Human Knows in any experience. When we create ANYTHING that we’re Loving while we do it, we engage our own Expression of Love into the energy of what we’ve created. We think of the next embellishment or special touch as part of our signature. Anyone who would look at it could see the Love that went into all the details. Without even Knowing it was Love that engaged them, people would wonder at how it all came together. I created a keepsake box from a hobby store cardboard box that looked like a book. I only had one idea when I started, but as I finished one embellishment, another empty place called a new idea. Then it was like this box was becoming worthy of more. I took pieces from various art projects. I used a marbled canvas from an acrylic paint pouring project to line the bottom. Because of that, it needed some leather trim around the edges. By the time it was done, the box incorporated 20-30 hours of pieces of other art projects from wool felting pieces, enameled glass, to broken egg shells glued down, painted and burnished to look like reptile skin. I believe ALL creation works like that. We start on something we’re especially interested in, enough we’d do it just because we like doing it. When we Know God Knows the Desires of our Heart, God will reach us through Creation. When our mind is OPEN to RECEIVE the Inspiration of Spirit (AND WE’RE CONSCIOUS TO LOOK) we’ll Know genius thoughts always happen while we’re dreaming and creating. In the end, the experience will always be more valuable than Gold. Sun/AHAU holds the Power of Will, Determination, Patience, and Perseverance. On a Day we are given to consider “what will be,” AHAU reveals our Power to Create anything we Love. The Consciousness to carry it out will is only a matter of perpetual movement toward the manifestation of the Dream. We know this too. We’ve heard enough stories about the Human Will to accomplish what none before have done, in spite of overwhelming odds. We already Know we have the Consciousness to be what we want to be, even if it took us a lifetime – if we invested a lifetime figuring it out, we would be it. Looking at the Sun from an earthly perspective, the Light carries a shower of photons. They are catalysts of energy as particles that pass through us. They have an influence on the pineal gland, the seat of Human Consciousness. Photons trigger an excitation of Matter and Thought. Light wakes us up. The Sacred Steps of Creation follow the Human creation cycle of everyday. 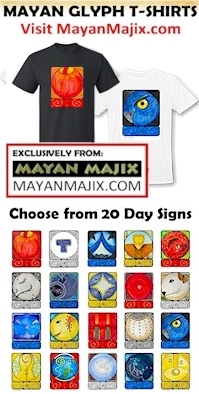 The Tzolk’in is a reflection of Human’s calendar within and the 13 hours of creation from morning til night. On Tone 1 we awakened just before Dawn. In the first hour (Tone 1) we stayed on the pillow to remember the Dream. On Tone 2 we looked to the window to see the Light of a New Day. We wondered. What will I create today. We have begun a new Planetary cycle, a Haab Year that intends for Human to Know our Divine Capabilities. 7 Road/EB is the road of Human’s destiny as written by the Calendar of Human. There is a Reason why our attention is being drawn to the Tzolk’in in this Planetary cycle of Transformation. We are setting a course for our Future Life. There will be many Dreams in a lifetime. With enough Life, Light, and Happiness, we’ll discern more and more things we Love and want to Create. The Power of Love to fuel them all is Inspired by the Sun. The best thing we could know right now is how to draw all the Sun’s Light that we can. CAUAC intends to deliver a Dream we Love. As we go looking for all the things we Love about our Dream, we’ll put on the many leaves of Love that collect the Light of the Creator’s Love. The more we spread our Love out, the closer our leaves with become to each other. To all my relations, may the Sun’s Light shine on where you are, your perfect Time and Place. May we hold Mother Earth in our hand and wonder at the Life that able to live there. May we see that, made of Earth, so do we hold the same potential for growing something beautiful. It would only be fair, if all things were Intended to be Equal. It would only be fair if we were all Loved the Same, and all Intended to know our own Greatest Happiness. May we stand on Number 1, that we were Divinely Inspired. We are being Inspired for a Reason – a Meaning and Purpose. May we know that our own Meaning and Purpose for Creation is the most important thing. A Divine Meaning doesn’t discern the profitability. That’s the world’s meaning for everything. Instead, we make a choice for Love, and rely on Divine Provision for the Way and the Means for a Divine Measure of Happiness. May we greet the Sun with Gratitude for the Warmth of Love and Happiness. May we Know that where there’s a Relationships between the Sun, and ALL the Elements of Earth – within a handful of Living Earth everything is possible. Sun/AHAU: Day of the ancestors and connection to their guidance. The divine face of the sun – lord, musician, singer, dancer, and marksman. Suns are artistic, heroic athletes, visionaries with wise judgment who lead and defend the people. So much is expected from themselves and by other people that unfulfilled expectations are a certainty. An accumulation of these disappointments may lead Sun to evade responsibilities, not accept corrections and even build resentment and disdain towards others. Suns should simplify their lives to be able to rise and shine with unconditional love once again. Cherokee, Flower/GUN’TSI EK: Symbol is the Sun, place of abode of Great Spirit. The Sun creates, nurtures, and is the super communicator, the way station that relays messages and energy from other stars in the galaxy; provides energy for channeling information from the Ancestors; speaking the Living Language of Light, which ignites the consciousness in others. Gold is the color of courage and opportunity of wealth. Creative arts, master craftsman expressing divinity and wisdom through their creations. The face of the flower follows the Sun gathering the fire of creativity, illuminating harmony and balance, resonating peace and continuity within the human spirit. This is the Sign of the Chalice of the Infinite, Caldron of Creation.